Logos can tell a lot about an organization's objectives and purpose. One example is Book of Mormon Central, a web page that purports to be neutral regarding Book of Mormon geography. Its logos (and content) tell another story. https://bookofmormoncentral.org/ is the web page of a nonprofit named Ancient America Foundation, which was chartered in Utah in 1983. To the right is its logo. It's a Mayan pyramid, of course. That's because Ancient America Foundation is 100% focused on Mesoamerica. You can see it consists exclusively of Mesoamerican proponents (although some of the early people had a more hemispheric concept at times). Next, let's look at a "division" of Book of Mormon Central. It's called Book of Mormon Archaeological Forum. It, too, is exclusively focused on Mesoamerica. At least this one has one thing actually mentioned in the text of the Book of Mormon: it has a depiction of metal plates. But you can read the text as many times as you want and you won't find any mention of pyramids, or buildings made of stone. BMAF recently updated logo to show how BMAF is a "division" of Book of Mormon Central. They are so closely linked that they share content. They certainly share ideology. 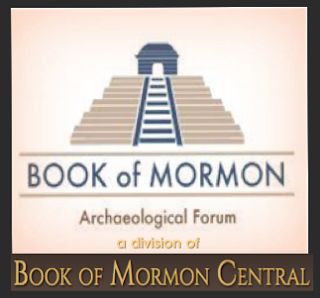 Next we have the logo for Book of Mormon Central itself. This is basically the old FARMS logo, showing Greek, Hebrew, Egyptian, and Mayan glyphs or characters. No ambiguity there. You can look at the other "affiliates" of Book of Mormon Central and see that they are all unabashedly focused on Mesoamerica. 1. the two-Cumorah theory (meaning, they insist the "real" Cumorah is in Mexico somewhere). 2. They reject Oliver Cowdery's Letter VII. 3. They think the storehouse of records that Joseph, Oliver and others visited on multiple occasions was actually in Mexico, and that Joseph and Oliver merely saw it in vision. 4. They think Joseph didn't know much about the Book of Mormon, that he speculated about where the Nephites lived, and that he relied on scholarship to solve the question. 5. They think the entire Western Hemisphere is the land of promise and the nation that Nephi prophesied would be the site of the Restoration, etc. Just to be clear, this is all fine. People can believe whatever they want, of course, and I have no problem with that. Let's just be clear that, far from being neutral about the geography issue, Book of Mormon Central promotes the Mesoamerican theory of Book of Mormon geography.